For the sake of Rowden, let’s take his rhetorial frame as not so ludercrious, and operationalize his ideas about growth. Rowden says that manufacturing is critical in a rising economy because it will provide jobs for those rural migrants who are moving off the (less productive) farms and into the cities. Here he’s basically laying out China’s development model and assuming Africa is going to play out similarly. Let’s put that issue of cross ‘national’ comparison to the side, and look at why his emphasis on manufacturing may be misplaced. Rowden seems perturped that industrialization has been removed as a link to development in recent years. I wonder if the de-linkage has to do with the import substitition industrialization plans that were implemented after liberation in many African colonies that wrecked national economies, sent the countries into spiraling debts, required bailouts from the IMF and World Bank who then imposed Structural Adjustment Programs that destroyed social services and the agricultural sector, which led to a decade of lost growth (1990s) despite the rapid democratization of the continent. Could that be why industrialization is no longer priority number 1 on the continent? Use infant industry protections, subsidize credit, and invest in R&D. His example to back up this claim: The United Kingdom, circa 1600AD. Oh, and all the bad things that happened when these policies were implemented before: they were sequenced ‘wrong’, used ‘wrong’, or driven by political considerations. Yet he doesn’t present a way of ‘correctly’ sequencing or using these policies and apparently assumes that political considerations of economic policies isn’t important that much any more. This should all be done instead of allowing the economy to be dominated by extractive industries. To rebut his first counter point, I would respond with the argument, which is not original, that African economies must produce and manufacture where they have a comparative advantange to the rest of the world. Currently, that’s in the agricultural sector for many poor African countries. Some countries might even have an absolute advantage if there weren’t farm subsidies in North America and Europe, but regardless, African manufacturing is not going to beat out Asia for jobs or supply. Perhaps when Asia transitions to their next economic phase of development we’ll see manufacturing jobs move to the African continent, but whey wait for that? Why not build a high-tech industry that focuses on the socio-economic needs of the continents citizens, or green energy developments, or invest in science and maths so that whatever the next innovation spurs the next worldwide growth spurt, Africans are just as capable of anyone else to participate in the globalized economy. This won’t soak up the labor moving into urban centers, so it’s not a complete solution. My second critique is that the exploitation of natural resources is not necessarily a bad economic policy if managed correctly. Following decolonization, African countries relied on their strong agricultural sectors to produce foreign exchange reserves that were then used to buy materials for industrialization. Unfortunately, through the devaluing of their currency in order to speed up the process, most African countries bankrupted their agricultural sectors and could not manufacture products that were of high enough quality or low enough price to be sold on the world market. Thus, natural resources provide a more effective way to build up foreign currency reserves that can then be strategically invested into industries that government and civil society believe will be most productive down the road. If this sounds unreasonable, I would direct you to understand Botswana’s development plan and its resounding success. Rowden’s focus on manufacturing is backwards looking and does not set the continent up for success. If any lessons can be drawn from the continent, it is that the economic policies and prescriptions of outsiders are not guaranteed to be any better than the national corrupt politicians. Thus, committing to long term policies that will make an economy adaptable and quick learning will serve developing countries best. On the topic of the ‘Africa Rising’ meme, after his prescriptions for ISI, Rowden’s critique on the meme is unveiled: Western countries are pushing their economic and industrial policies on African states, all while promoting the meme of ‘Africa rising’, in order to not have the give in to the demands of African leaders who wish more policy space. Rowdens analysis of African rising is thus not an attack on our meme in question per se, but it is part of his continuing critique of neoliberalism and the prescriptions it has for economic development. Rowden seems to view the meme as some insidious plot by Western nations to sustain their policy positions in the face of African opposition. That’s a crass way to look at the narrative in question, and he presents no evidence to sustain his accusation. While convenient for his worldview, to assume that the nations of the West could actively and subversively promote the idea of Africa’s rise to maintain the core principles of the Washington Consensus suggests a level of coordination and execution that is far and above any other foreign policy objective of the past 50 years. My disappointment with Rowden’s critique is that his perspective is not necessarily wrong: there are other ways to measure growth and the world needs to move away from the reliance on GDP per capita as the benchmark for economic success. However, for a non-economist/non-Africanist to write a piece that paints the argument that because the African continent is not industrializing like the Western world did 200-300 years ago this is then evidence that Africa is not actually rising and the meme of Africa Rising is a plot by supporters of the Washington Consensus, completely undercuts any critique of the measure of economic success he may wish to contribute. 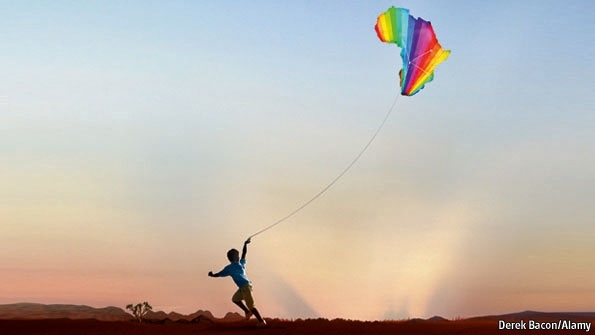 The perception of Africa Rising may be becoming so strong that even those unfamiliar with the data or the continent may begin to promulgate the idea. This bodes well for changing the stereotype of the continent in the minds of most. However, I believe this meme is still fragile and could be under cut by growing interactions with the continent that may not align with the general meme: violence in Nigeria, Mali, Guinea-Bissau, Kenya, and Somalia all threaten to continue the idea of Africa in Crisis. The politicking of South Africa’s ANC, the corruption of Zimbabwe, Angola, and Guinea, or the growing radicalization of the continent’s Muslim population do not align well with the Africa Rising meme. A major tenant of good public diplomacy is that the values and ‘truth’ behind a meme must line up with the meme itself or else the hard work spent at promulgating the meme will be quickly undermined by the real truth of the idea. Thus African governments, and civil society organizations, must capitalize on this meme and push for greater reform and regulations that will capture the growing enthusiasm for the continent, while at the same time conducting greater public diplomacy campaigns to increase engagement with foreign communities and diaspora groups. This will allow for a strong foundation of the ‘African Rising’ meme and prevent the wave that so many African nations are currently riding from crashing down. This entry was posted in Politics and tagged Politics by Alex Laverty. Bookmark the permalink. 1..You stated that I am an author who has rejected the Washington Consensus on development and I’m “not an economist, not an Africanist, not a political scientist, and not a public diplomat, which may account for the frame” of my thesis. I don’t believe my background is necessarily relevant to the points I try to make, however I did my MA and BA in International Relations and lectured in Political Science and Global Studies at the university level for a few years in California before going to work in Washington DC, where I worked with NGOs on international development policies for nearly a decade. I worked for the international development NGO, ActionAid, which provided me with many opportunities to travel in Africa over many years where I was able to often meet with domestic business associations. I really enjoyed these opportunities to ask them what were the major constraints they faced in terms of expanding production and employment and they often listed two items: the high interest rates on commercial credit (due to the very low inflation targets set by central banks with IMF – the main way to drive inflation down and keep it down is to jack up interest rates) and too much competition from the floods of cheaper imports coming into their countries (because of the premature and rapid trade liberalization), both of which are cornerstones of the Washington Consensus. Thus, my critique of the consensus was informed by these discussions with domestic African companies and business associations. 2.. You stated that I said “The measures of development (GDP, consumption, and trade) are wrong.” However, I did not say these indicators are “wrong” but that they “only give a partial picture of how well development is going”. 4.. You state that my rationale for this was “Because all the other countries who grew first (the West), first industrialized in their development stages.” But I did not say this. I pointed to all the countries which have successfully industrialized and developed – not grown. Nor did I only refer to those industrialized countries in the West, but also industrialized countries in East Asia as well. You then state that: “This cross temporal comparison is shocking, because it basically makes the argument that there is only one way to grow a national economy! Which contradicts his argument against the use of neo-liberal economic markers (GDP per capita, consumption, and trade) to measure growth!” Again, my article is about “development” and not GDP “growth”. You then suggest readers take my rhetorical frame as not so ludicrous and operationalize my ideas about “growth”, but again, I am writing about development, not growth. 5.. You then say that my point about how “manufacturing is critical in a rising economy because it will provide jobs for those rural migrants who are moving off the (less productive) farms and into the cities” is “basically laying out China’s development model and assuming Africa is going to play out similarly” but I did not say this was only China’s development model but rather it was the model used by all industrialized economies beginning with the UK, the European city-states, the US, Japan, the 4 Tigers of East Asia and China. 6.. You wonder if my concern with the fact that industrialization has been removed as a link to development in recent years has to do with the import substitution industrialization (ISI) plans “that were implemented after liberation in many African colonies that wrecked national economies, sent the countries into spiralling debts, required bailouts from the IMF and World Bank who then imposed Structural Adjustment Programs that destroyed social services and the agricultural sector, which led to a decade of lost growth (1990s) despite the rapid democratization of the continent” and ask if that could “be why industrialization is no longer priority number 1 on the continent?” I have heard many critiques of the flawed implementation of the ISI strategies but I have never before heard that they were responsible for the debt crises of the 1980s. In fact, three other factors are widely credited for the debt crisis: 1) the global economic recessions of the early 1970s and late 1970s/early 1980s, when rich countries slowed their consumption of goods produced in developing countries, causing many to suffer losses in export earnings as rich countries consumed less; 2) the dramatic increase on interest rates on the loan variable interest rate loans (as opposed to fixed rates) that African countries had taken out in the 1960s & 1970s when western banks were flush with cheap petrodollars recycling, which made otherwise sustainable payments suddenly quite unsustainable; and 3) the breaking up of international commodity boards (that had set guaranteed prices for developing country exporters on world markets) as part of liberalization measures pushed by Reagan & Thatcher, which caused commodity prices to dramatically fall on world markets, meaning that developing countries suffered dramatic declines in the export revenues they had otherwise planned on earning. 7..You then state that “African economies must produce and manufacture where they have a comparative advantage to the rest of the world. Currently, that’s in the agricultural sector for many poor African countries. Some countries might even have an absolute advantage if there weren’t farm subsidies in North America and Europe.” However here you only refer to the notion of static comparative advantage, i.e., their comparative advantages right now today. You neglect the more important notion of dynamic comparative advantage, i.e. the realization over time of future comparative advantages with the use of a long-term national development strategy and industrial policies, as all of the rich countries did. If you only focus on static comparative advantage, this logic will keep countries locked into plantation mode for forever. Neoclassical free trade theory promotes the notion of static comparative advantage by suggestiing that African countries ought to just stick to producing what they are currently good at, or endowed with in terms of natural resources. But African countries need to distinguish between their current “static” comparative advantages at the present time and the possibilities for their future “dynamic” comparative advantages in 10, 20 and 30 years from now, and which industrial policies can be used to realize these over time. For example, when South Korea decided to begin supporting the early development of a ship building industry in the 1960s, the World Bank then advised Korea to just stick to its comparative advantage in primary agricultural commodities. But instead Korea “defied” its static comparative advantage at the time and used industrial policies to begin building over time the industries necessary for it to become a world class ship builder by the 1990s. To suggest that African countries only focus on their current comparative advantages is to undermine their possible long-term industrialization trajectories. 8.. You then say, “but regardless, African manufacturing is not going to beat out Asia for jobs or supply. Perhaps when Asia transitions to their next economic phase of development we’ll see manufacturing jobs move to the African continent, but why wait for that?” But did the US and mainland Europe wait for the UK to deindustrialize someday before they moved forward with industrialization strategies? No, rather they did just what the UK had done a couple hundred years before them and began industrializing with trade protection, subsidy support and government assistance with R&D in technology and innovation. Japan, the 4 Tigers and China all later did the same as well. 9. You then suggest that my meme is to say that “Western countries are pushing their economic and industrial policies on African states, all while promoting the meme of ‘Africa rising’, in order to not have the give in to the demands of African leaders who wish more policy space.” In fact, my point is that the opposite is the case. Through policy advice and loan conditions by donor aid agencies, and with the contents of free trade agreements (FTAs) and bilateral investment treaties (BITs), the rich countries are pushing the exact opposite of the policies of those which they all had used successfully for development onto the poorer countries: rapid and premature trade liberalization, static comparative advantage, and a host of other problematic policies that were not at all the ones used by the rich countries as they were industrializing. 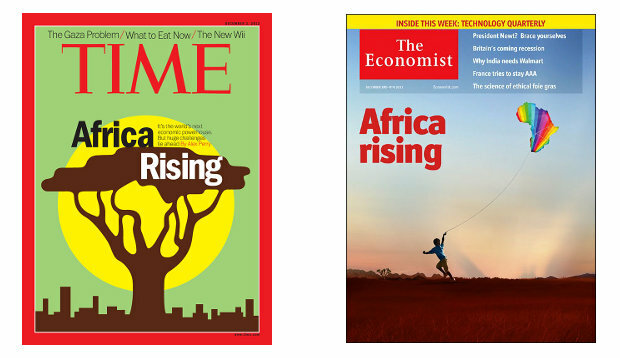 Further, as the rich countries (I do not consider Japan as part of “the West”) do this, their leading publications such as TIME and The Economist are claiming Africa is “rising” when in fact Africa is not at all building its domestic manufacturing base. You claim that I seem “to view the meme as some insidious plot by Western nations to sustain their policy positions in the face of African opposition.” But I did not at all say this. I’ve got no idea what goes on in the hearts and minds of policy makers in the rich countries, nor would I pretend to know. As a policy analyst, all I can do is study policy approaches and their outcomes, both historically and currently. Clearly, the rich industrialized countries that have developed and greatly increased the per capita incomes and standard of living for their peoples all did certain things (industrialization with the use of industrial policies over time) that today African countries are being blocked from being allowed to do. I did not personally engineer these criticisms of African governments in the G33 or the NAMA 11 countries, nor did I put words into the mouth of Nana Akufo-Addo. Further, you state that I presented “no evidence” to sustain my accusation, yet I did in fact include hyperlinks for books by Ha-Joon Chang, Erik Reinert and Alice Amsden, which all exhaustively document the use of industrial policies in the course of the successful development of the industrialized countries. Again this is not convenient for “my” worldview, but is in fact actually the opinions of the G33 and NAMA 11 countries in the WTO, the African Development Bank report, the UNCTAD/UNIDO report, as well as Akufo-Addo, all of whom I cited. Nice rebuttal, I can see you put some effort in that. However, it’s surprising that you state that “I don’t believe my background is necessarily relevant to the points I try to make”. In general, that’s a very odd thing to say, and implicitly you acknowledge this by giving us a shopping list of your experience. I’ve noticed though, a lack of basic understanding of the economy, econ 101 if you will. I can’t stress enough the necessity to at least know what Y = C + I + S entails, before making all sorts of claims about the economy. In your point 8, you claim that the UK industrialised “a couple hundred years before” the “US and mainland Europe”. It was a couple of decades, NOT 200 years. That is a shocking lack of historical knowledge, or perhaps a glaring absence of a sense of time. I can see that you two don’t disagree on some main issues, which is a good thing. I hope this won’t lead to acrimony on either side. It’s an interesting discussion. Nice exchange! It seems Rick Rowden is making the right point here. I’ve recently listened to a couple of respected African economists in Beijing and Tokyo and it looks like they both would agree with Rowden. Development (a long run process) is often confused with output expansion (a short-run outcome). Also, Rowden is right in that static comparative advantage isn’t as important as the dynamic one when it comes to developing countries. Korea, Taiawan, Thailand, China, etc…were as poor as African countries in early 1960s. They also share similar comparative advantages. But instead of staying stuck in their static comparative advantage (as did African countries) they embarked in strategies of dynamic comparative advantages, that helped them moved into different economic structure. Another point is what Rick’s opponent wrote, ” I can’t stress enough the necessity to at least know what Y = C + I + S entails, before making all sorts of claims about the economy.” This GDP equation seems to be wrong. Assuming G is irrelevant, Y=C+(S-I), (S-I) being net capital flows. In a closed eco, perhaps the GDP equation should include only either S or I and not both.